Over time, Amazon’s sales have increasingly come from third-party sellers as opposed to their direct product sales. As Amazon’s market presence has grown, more and more sellers have been willing to pay the 10-15% commission in exchange for the exposure of being listed on the giant’s website. At this point, 40+ percent of Amazon’s sales are now obtained through third-party sales. The Make an Offer feature is not the same as what you would experience on eBay or other auction sites. 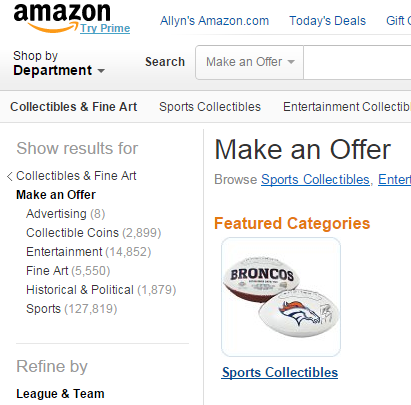 This feature allows you, the potential purchaser, to specify a price you want to offer for a specific collectible item. Once you enter your price bid and click on a “Send offer to the seller” button, the negotiation regarding price becomes a private affair between you and the seller. Note that while negotiations are taking place, another buyer could possibly offer full price. If that happens, the seller is under no obligation to further consider your offer. Assume you want to search for items signed by new Hall of Famer Craig Biggio, the first Houston Astros-associated player inducted into the Hall. To do this, you could simply enter “craig biggio” into the search box at the top of the main Amazon website page. The results of this search will be all items on the Amazon site related to Biggio. Remember that not all collectible items will include the Make an Offer opportunity, so many of the search results will not provide this new option. One item you might find is a Craig Biggio Autographed Baseball from Sports Memorabilia, one of the numerous third-party sellers using the Amazon site. This ball is currently on sale for $129.27 with free shipping. The new feature is available for this item, so you will see the “Make an offer” and “Buy it at the current price” click-button choices on the right side of the page. Let’s say you think the asking price is too high and you want to offer only $110.00. To submit the offer, simply click on the offer circle, enter your offer amount in the entry box provided and click the “Send offer” button. Amazon sends an email to the seller with your offer information. The seller will respond within 3 days, accepting or rejecting your offer, or negotiating further. If the seller accepts your negotiated price you will then follow the same process to purchase the item as with any other Amazon purchase. What if you just want a picture of pitcher John Smoltz, another player recently voted into the Hall of Fame? This time, when you get to Amazon, enter “make an offer john smoltz” into the search box. This will drive you directly to the player’s collectible items that have the make an offer feature enabled. Note, however, that this more specific search method may have left out numerous other Smoltz-related collectible items, ones that do not utilize this feature. Look through the available items. One great autographed picture of Smoltz is listed as John Smoltz Signed Atlanta Braves Horizontal 8×10 MLB Photo . It is currently priced at $109.08, a savings of 29% from its original price, plus it comes with free shipping. Obviously, the seller is trying to get rid of this last copy, so you might be able to get it at a lower price. Use the process described in Example One to make an offer and see if you can cut the price down a bit more. A quick reminder about purchasing autographed collectibles: be sure to check the detailed product description further down the page to insure that the item comes with a Certificate of Authenticity (COA). If there is no COA, don’t buy it. You could be buying a fake autograph. 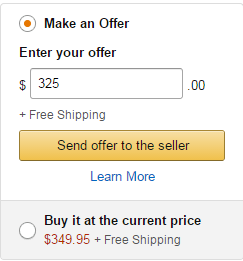 This is an interesting way for Amazon to try to beef up their product sales. They are benefiting you by giving you an opportunity to suggest a lower price for an item. Plus, they could be helping their third-party sellers by promoting sales from individuals who may not want to pay the asked prices. But don’t just read about it, see for youself. Wow a great post and i knew nothing about it until I read your easy to digest and very informative post. Thank you so much I’m off to put in some offers lol. Thanks Simon. The great thing is that we can now challenge the price being asked. If it appears that the item is the last one left, we might as well see if we can cut the price a little. Derek Jeter memorabilia can’t be challenged at this point in time, however, an autographed item from a normal good player might go for a bit less than asked. Hi Walt. Thanks for visiting my site. You are absolutely right. This feature should be of great benefit to sellers. Having the option to bid a lower price will draw in a larger number of potential buyers, hopefully increasing sales. The buyer, the seller, and Amazon should benefit. This is good to know and I was not aware of it Allyn. I was not aware of it and will make sure to check it out. Maybe I can pick up some good memorabilia. Randy, there is a lot of cool stuff out there. Do you have a favorite team? Amazon is set up so you can search by individual, by team, or by item. They also sell some fun pinball style baseball games that younger ones may enjoy. Hi Allyn, thanks for the informative post on Amazon’s new feature. You are very welcome, Edmund. The feature applies to collectibles in other areas such as electronics and fine art, also.